for all your portable restroom needs! 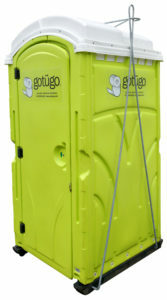 There's only one company to call when deciding on a portable restroom and that’s gotügo! Choose the company who's level of service and quality of product is unmatched. Choose the company who thrives on superior customer service that surpass all others...a company, who for the last 30 years, has reinvented the portable restroom industry to give our customers the kind of quality they deserve. Call gotügo! Tell us who you are and what your needs are and we’ll get working on it right away!